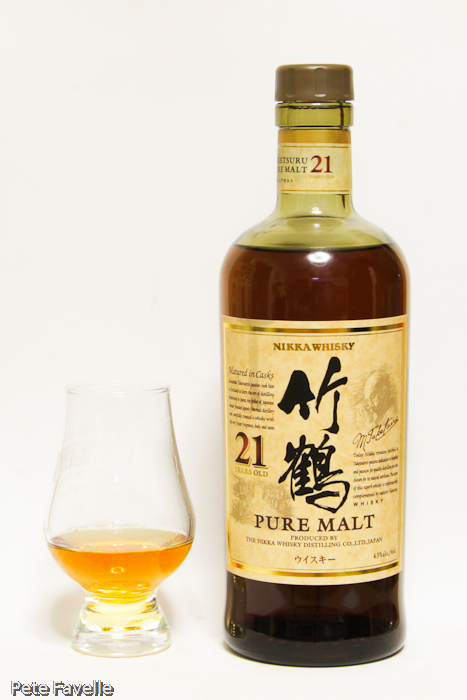 After setting up Suntory’s Yamazaki distillery outside of Kyoto, Masataka Taketsuru left to found his own company which was to become Nikka. His new company built its first distillery, Yoichi, on the northern island of Hokkaido. Thirty five years later, a second malt whisky distillery was set up further south, on Japan’s main island of Honshu. Miyagikyo’s whisky is considered softer than that produced in Yoichi, but both distilleries show their Scottish inspiration – in their location and their production. 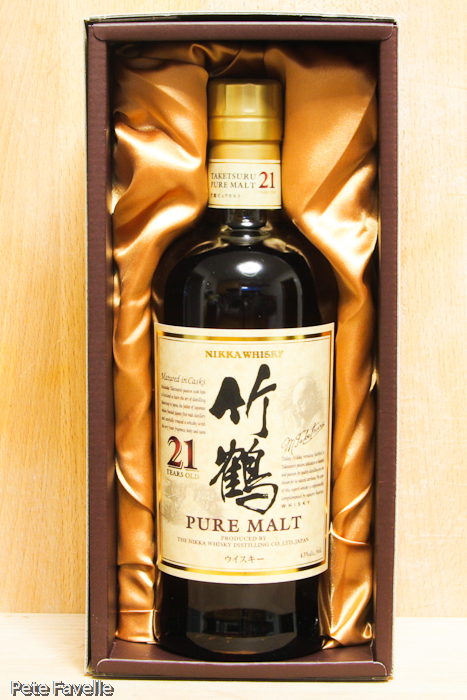 As well as producing single malt whiskies from both of these distilleries, Nikka market a range of what they call “pure malts”; malt whiskies blended from both Yoichi and Miyagikyo. Nikka Taketsuru 21 Year Old has a lot to live up to, having been crowned the World’s Best Blended Malt, back in 2010. It certainly looks the part, presented in a luxurious, silk- (or at least, silk-feeling-) lined box, looking every inch the award-winning dram. But of course, whisky is supposed to be drunk rather than admired! The aroma is curious; an almost solvent-like initial hit soon dissipates, leaving vanilla notes, green wood and a light, sugary sweetness. Over time, richer and more fruity tones appear with honey-dipped redcurrants and perhaps a hint of tobacco. With water, the sweetness is reduced and richer spice notes appear – cinnamon and freshly cracked black pepper, in an old wooden box. In the mouth, it’s deliciously smooth – honey sweet on the tip of the tongue which becomes fruitier over time. Beneath is a nicely building spicy edge with fresh pepper and dried orange peel. The finish is lingering and sharp. Watered, it’s lighter and the spiciness is richer, warmer and more pronounced, although the honey edge is lost. The warm citrus nature of orange peel is more significant too, but without such a noticeable bitter edge. The finish stays sharp but doesn’t linger as long. With or without water it’s phenomenally easy-drinking – not as complex as you might expect from a medal-winning 21 year old, but delicious nonetheless. 4 stars.